Ballpark Basics: A nice park, whose potential has not yet been reached. 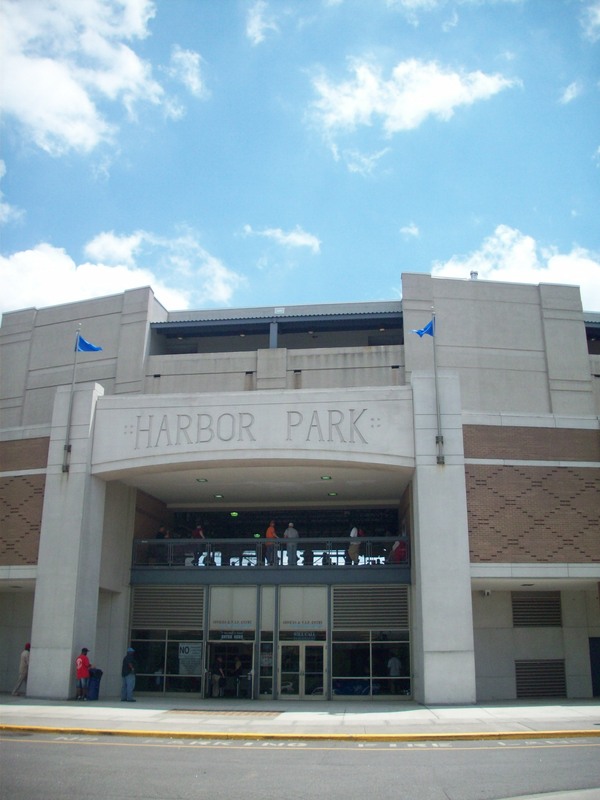 Ballpark Breakdown: Located a short walk from downtown Norfolk, Harbor Park opened in 1993 along the Elizabeth River in an area that was known as the “Bessie’s Place”. The park was designed by HOK Sports (now Populous) and the outside looks almost like a miniature U.S. Cellular Field due to its precast concrete façade with the name of the ballpark carved into it. There is ample parking around Harbor Park but there is a five dollar charge for each car. Once your only real alternative was walking – a daring undertaking as (coming from downtown) you will need to traverse some major roads and walk under some highway underpasses. Happily, and just recently, with the funds from the Obama Stimulus Program, Norfolk has completely a light rail system. 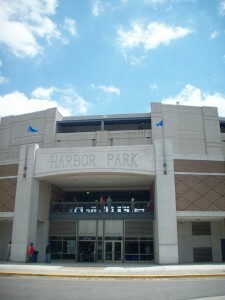 “The Tide” as it is known is the envy of nearby cities, and stops right at the doorstep of Harbor Park. 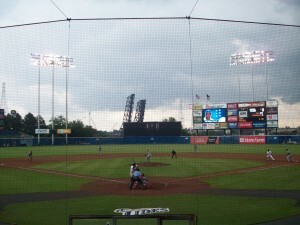 The ballpark is basically on the banks of the Elizabeth River, but it can be difficult to know that there is any water behind the outfield fence. The view of a raised bridge and the occasional ship will let you know that there is a body of water behind the outfield fence. If ever there was a ballpark that could use a wraparound concourse, Harbor Park is it. The water behind the ballpark would make a great place to watch the game with the backdrop of water behind you. 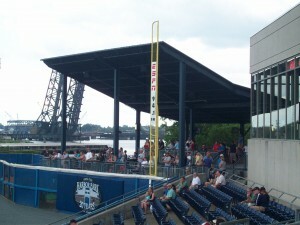 They have recently added a party deck behind the right field wall that has become the closest thing to seats near the water. This also caused the right field wall to be moved in 20 feet and “Next to the Party” in the right field corner, is the “Hits at the Park” Restaurant where you can watch the game while dining on a buffet. 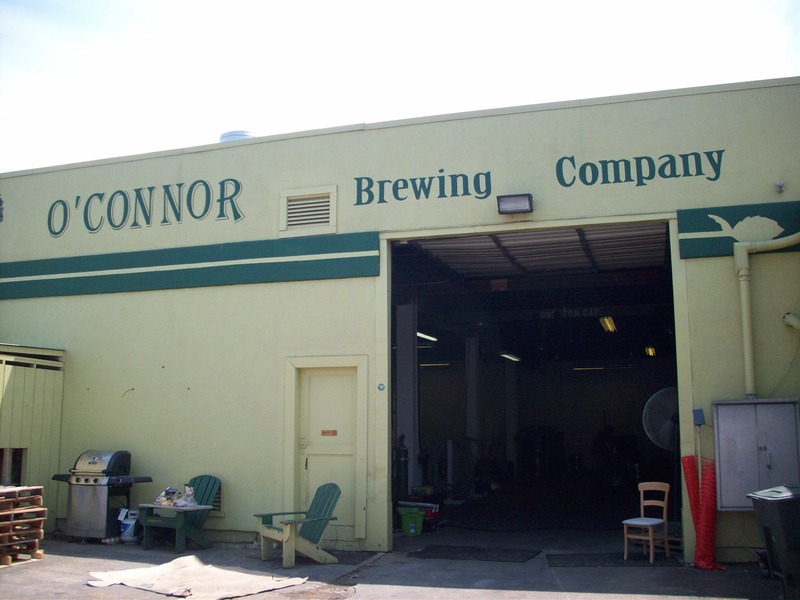 And while we’re on the topic, most of the concession stands sell only Bud or Coors products, but there are a couple of places in the park that you can pick up a craft beer; even some from the local brewery, O’Connor Brewery (reviewed below). Down the third base line on the main concourse is the Park Avenue Brewery stand. While it only has bottles, it has multiple options for craft beer including options from Starr Hill, Harpoon, Flying Dog, New Belgium and O’Connor. On the concourse behind home plate there is a stand that has O’Connor on tap as well as a Goose Island selection. The concourse that does wrap around the field is nice an open so you can watch the game as you go to pick up your food and drinks. The Tides had been the Triple-A affiliate for the New York Mets since 1969. However, that affiliation ended in 2006 when the Tides became the Orioles affiliate. The 38 year affiliation was the second longest in baseball when it ended just behind the Richmond Braves (which have since moved to Gwinnett, GA). The majority of the seats (9,000) are in the lower bowl with another set in the upper deck (2,800 seats). There are also 24 suites that wrap around the infield above the lower concourse. Behind the left field wall is the picnic area. Here there are rows of picnic tables. A very small child play area is tucked into the corner of the left field concourse with a small inflatable and a pitching game. 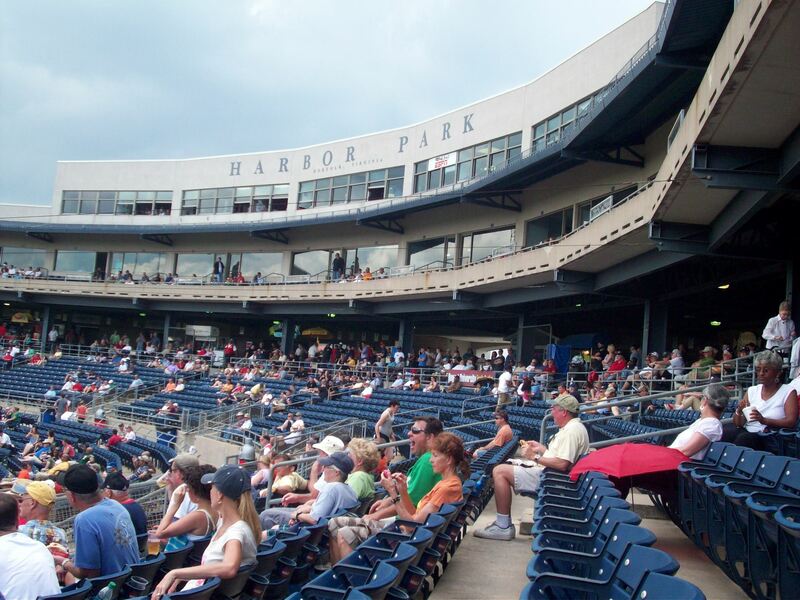 There was actually talk of expanding the ballpark during the search for a new home for the Montreal Expos when they were looking to move to a new city until they lost out to Washington, D.C.
For a Triple A ballpark that is almost 20 years old, Harbor Park has held up pretty well. While it could use a little modernization in the scoreboard and the addition of an outfield concourse it is a great place to catch a game. 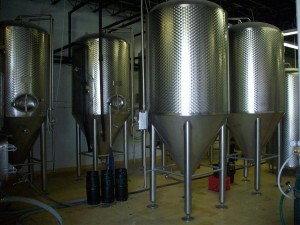 Brew Basics: A small but growing brewery, that seems headed in the right direction despite some municipal red tape. Housed in a yellow and green garage in an industrial/warehouse district of Norfolk, VA., O’Connor comes with very limited parking spaces – but it doesn’t really matter because the only real reason to stop by would be to visit with the really nice guys that work there. ABC and the feds are ok with the brewery selling it’s wares, but apparently the city of Norfolk has thrown up some red tape, so you can’t buy – or even taste – on premise. In fact the beers being brewed behind these garage doors can only leave in keg form. No growlers or even bottles. 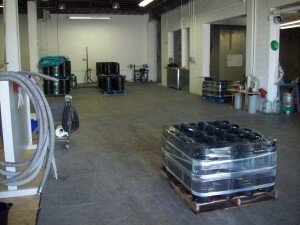 The only way these beers are leaving the warehouse are as kegs of deliciousness. We have yet to try an O’Connor we didn’t like, and apparently we are not alone in that view. A few years ago, O’Connor got in with Brown distributing, broke into a bunch of new markets…..and quickly realized they couldn’t keep up with the massive demand. They pulled back, stockpiled, and now with their 10 barrel brewhouse, six fermenters twice that size and three Brite tanks they are storming back onto the scene. If you live anywhere near the DelMarVA peninsula, expect to see O’Connor making an appearance at local street festivals, your favorite haunts, and hopefully soon, your grocery store. Red Nun Red Ale (5.5% ABV, 35 IBU) – This red beer is aptly named as it pours with just a slight head and a true amber hue. It appears highly carbonated but really isn’t too sparkly in the sip; in fact, it’s a very smooth beer. Slight coffee aroma and a bit of coffee flavor that gives way to a solidly malted taste in the sip and aftertaste. Currently the only one available regularly in Richmond. Black Dismal Black IPA (7.5% ABV, 65 IBU) – Black Dismal is awesomely named after a local swamp and wildlife refuge. It pours a dark coffee color (O’Connor likes to say it is “Dismal in color” Get it?) with a hint of ruby in the right light. It smells of cacao, and is rich and hoppy. This is a robust beer that is thick but easy to drink with a palate that is smooth and smoky, and lingers tartly for just a second. Although this is a limited release beer, it was the first we were able to get locally. We tried this one evening when out to dinner, and like it so much we made the drive to the O’Connor garage the next day.